View More In Window Insulation Kits. 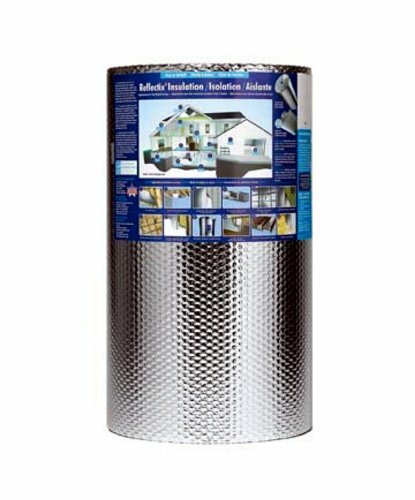 24 inch x 50', square edge roll double bubble foil both sides, reflective foil insulation, 5/16 inch thick with two outer layers of aluminum foil, each foil layer is bonded to a touch layer of polyethylene for strength, reflects up to 97% of the radiant heat with an R-value of up to 14.3 depending on application, excellent vapor barrier for below grade installation, class a/class 1 fire rating, approved by boca, icebox, sbcci, ccmc, ftc-compliant, is non-toxic, non-carcinogenic, lightweight & can be installed with scissors, staples & tape, hundreds of applications: wall, roof & basement, garage door, camper, metal or pole barn, window Coverings, stables, hatcheries, etc, sell by linear foot or roll. If you have any questions about this product by Reflectix, contact us by completing and submitting the form below. If you are looking for a specif part number, please include it with your message.